In a Nutshell: Melissa Halliburton had the idea for BringFido after nearly missing her friend’s wedding because she couldn’t find a pet-friendly hotel nearby. Launched in 2005, BringFido has since become the world’s premier pet-friendly hotel and travel directory. You can view hotel rates, fees, and detailed pet policies before you redeem your travel rewards — so there aren’t any surprises upon arrival. The site and mobile app list pet-friendly restaurants, events, and activities at your destination and provide tips for preparing your pup to fly. You can even use the BringFido app, which employs location-based technology to find fun things to do with your four-legged friend once you arrive. Dogs are so much more than just animals we live with — they are beloved additions to our households. In fact, 95% of pet owners consider their pets to be members of the family, according to a 2015 Harris Poll survey. No matter how much we love them, though, many places are typically off-limits to our furry friends. We’d love to bring our pup to work or out to a restaurant, but most aren’t pet-friendly. Even taking your dog on vacation hasn’t always been easy. Melissa Halliburton experienced that firsthand when she was asked to be a bridesmaid in her friend’s wedding and traveled to the ceremony with her dog Rocco. She couldn’t find a hotel anywhere near the venue that allowed pets and had to settle for booking a room an hour away. To make matters worse, her car broke down the next day and she had to convince a tow truck driver to take her and Rocco, who was dressed in his tux, to the wedding. She arrived just in time for the ceremony, but her ordeal inspired Melissa to help others avoid her experience. “Since there were no directories for people traveling with pets at the time, Melissa decided to design BringFido, a website to help travelers plan trips with their dogs,” said Erin Ballinger, a Pet-Friendly Travel Expert at BringFido. 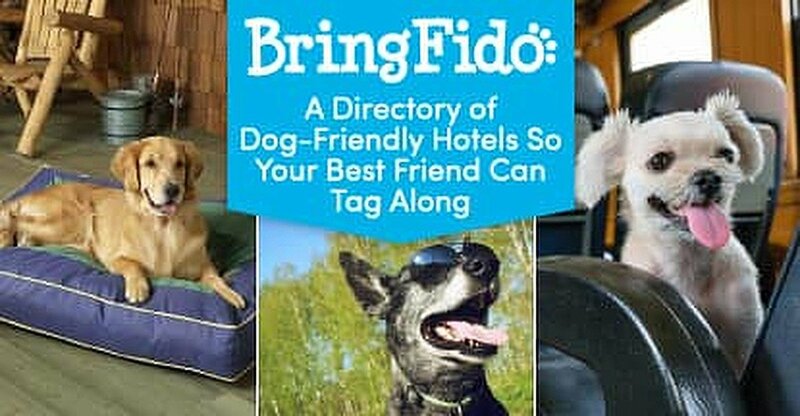 Since its launch in 2005, BringFido has become the world’s largest pet-friendly hotel and travel directory. And the site has grown alongside the desire of travelers to spend more time with their dogs. BringFido lists more than 100,000 places around the world, including hotels, bed and breakfasts, campgrounds, and restaurants, among other, where travelers can bring their dogs. Travelers can book lodging and fill their entire itinerary with dog-friendly activities and events — all on BringFido.com. You can type a destination into the site’s search bar and quickly see prices, amenities, and activities nearby. Ballinger said that Las Vegas, Myrtle Beach, S.C., San Diego, and Asheville, N.C., are some of the most popular pet travel destinations. View the ratings — on a scale of 1 to 5 bones — to learn from experiences of other visitors with pets before booking. But BringFido’s usefulness doesn’t end when you book accommodations. Download the app on iPhone or Android to unlock location-based amenities that can serve as your canine concierge. “Our app has location-based technology, so while you’re on a trip with your dog, you can open it and check out the pet-friendly restaurants, attractions, and services nearby,” Ballinger said. With its website and app, BringFido takes all of the guesswork out of traveling with your dog, and it starts with transparency about pet policies. Every property has its own set of pet policies, and they are nearly as varied as dog breeds themselves. Establishments often have limits on the size, breed, or number of pets you can bring. Some have refundable deposits while others have pet fees on top of the nightly room rate. BringFido delivers these important details upfront, not in fine print. Booking accommodations without knowing that information upfront could lead to a disastrous trip, which is why BringFido displays it prominently. A quick glance at any listing will tell you not only hotel policies, but also what to expect at other venues — including whether dogs are only welcome in outdoor seating at a local restaurant. Before bringing your dog on vacation, consult BringFido for tips on how to make the trip more enjoyable for you both. While taking a road trip with your dog can be fairly straightforward — including plenty of stops for walks — flying with your pooch may require more preparation. BringFido has an extensive list of advice for flying with your dog, which covers tips for booking, check-in, and keeping your pet happy in-flight. The primer even includes a packing list for your pup that ranges from common sense items — like a health certificate and medication — to items you might need but would forget to pack, such as a spare collar and ID tag. BringFido’s mission is to make traveling with your dog easier. The site accomplishes that with its advice to help you plan, book, enjoy, and return from your trip ready to do it all again. Dogs bring us so much joy, the least we can do is include them in our plans to cash in on our credit card travel rewards. But planning a trip with your pup hasn’t always been an easy proposition — just ask Melissa. That’s why she created BringFido, a comprehensive resource for traveling with your dog. The site and mobile app provide detailed information on pet policies upfront and allow users to book a room, plan activities, and even learn the ins and outs of air travel. Pets aren’t just loyal companions, they’re considered members of our families. And BringFido helps you keep the entire family together the next time you take a vacation.